The Brunswick Edge Double Roller bowling bag is a step up from basic due to higher quality fabric, larger pockets, and more deluxe features. This bowling bag carries up to 2 bowling balls, shoes up to a men's size 17, and still has plenty of room for lots of accessories. With a 5-year limited manufacturer's warranty we are not sure what more you could need in a bowling bag. With bowling balls and accessories included, it will weigh around 30lbs. Is the handle 39 or 36 inches? The handle is 37" on this model. 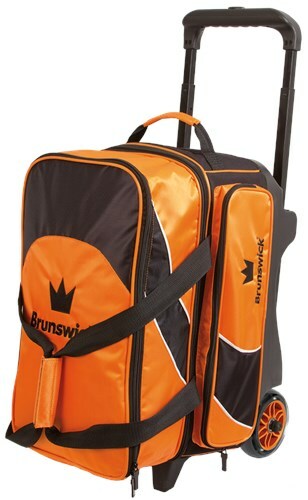 Due to the time it takes to produce the Brunswick Edge Double Roller Orange ball it will ship in immediately. We cannot ship this ball outside the United States.